Amazon expects to move into a new, 813,120-square-foot distribution center near North Lamb Boulevard, just north of Interstate 15, by summer. The complex is under construction. Courtesy Hard Rock Hotel & Casino Las Vegas unveils the first phase of a $13 million remodel of its Casino Tower. The property has renovated 575 standard rooms and a second phase will upgrade the remaining 65 luxury suites. Upon completion, 640 rooms and suites will be renovated. Amazon.com Inc. announced plans in November that it will more than double its Southern Nevada footprint. Amazon’s first Southern Nevada facility was also in North Las Vegas and occupied about 286,000 square feet. The online retailer also has a facility in Reno. “In April of last year, I was proud to be a part of the grand opening of Amazon’s Reno fulfillment center, where I was amazed by the technology, innovation and job creation Amazon brings to Nevada,” Gov. Brian Sandoval said. The new center will employ more than 1,000 new workers. The company already employs more than 1.500 people at its fulfillment centers statewide. Clark County was ranked second for investment homes held by out-of-state owners in a November report by Attom Data Solutions, a company tracking housing nationally. The report said 73,629 single-family homes, or 48 percent, of properties that are investor-owned are held by people outside of the valley. Clark County is second to Arizona’s Maricopa County. That region, which includes Phoenix, has 88,947 single-family homes held by out-of-state investors. Statewide, out-of-state investors hold 91,659 single-family homes; 60 percent, or 54,823 homes, are held by California investors. Marcus &Millichap, a commercial real estate investment services company, announced the sale of Flamingo Durango Self Storage in November. The 107,576-square-foot facility at Flamingo Road and Durango Drive contains 917 self-storage units across 13 buildings. Cameron Glinton, a senior associate in Marcus &Millichap’s Las Vegas office, said the facility was 93.6 percent physically occupied and 80.2 percent economically occupied at the time of the sale. LeClaire and Glinton represented the seller and procured the buyer. Alexia Crowley, a senior associate at MDL Group, received her Certified Commercial Investment Member designation, MDL reported in November. Crowley specializes in medical and professional office sales and leasing. She is a University of Nevada Las Vegas graduate with a bachelor of science in business administration. Besides the CCIM designation, she is a Leadership in Energy and Environmental Design green associate. Hard Rock Hotel &Casino Las Vegas is unveiling the first phase of a $13 million remodel of its Casino Tower. The property has renovated 575 standard rooms and a second phase will upgrade the remaining 65 luxury suites. Upon completion, 640 rooms and suites will be renovated. 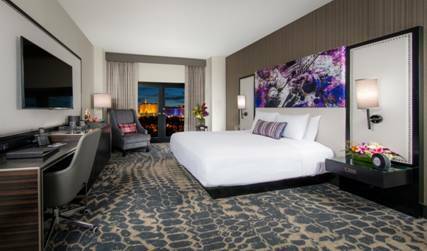 The Casino Tower’s remodel includes sleek new furnishings, quartz countertops, spa-like oversized baths with marble flooring, lighted makeup mirrors, new artwork adorning the walls and convenient USB ports throughout each room. Amenities include a fully stocked minibar, 55-inch high-definition TVs and exclusive bath essentials. Each room is also equipped with French doors that open to the pool or city views. The newly renovated tower accompanies the property’s 15-story HRH All-Suite Tower with 359 suites, eight spa villas and seven penthouse suites; and its 17-story Paradise Tower with 490 rooms and suites. On Nov. 21, Gardner Co. announced Ed Vance and Associates as the architects for the UNLV Harry Reid Research &Technology Park. In July 2016, the UNLV Research Foundation had selected Gardner Co. as the master developer for the Research &Technology Park. Gardner hopes to break ground by fall 2017. MDL Group will hold a groundbreaking ceremony for its Jones Beltway Business Park Dec. 13. at 11:30 a.m. There will be a Champagne toast and prizes. The 16,500-square-foot office development will have two buildings on 1.93 acres. The complex will be at 5960 S. Jones Blvd. MDL Group is a local small business (commercial real estate and property management) that made the decision to build its new office building versus leasing or buying an existing building. Founded in 1989, MDL Group provides services including property management, brokerage sales and leasing, real estate investment advisory, construction management and development services. MDL Group has been ranked No. 1 third-party property management company with approximately $1 billion value of real estate assets under management and has over 40 employees. MDL Group is a member of CORFAC International, a network comprised of privately held entrepreneurial companies spanning 48 firms in the U.S., seven in Canada and 25 in international markets including Colombia, France, Germany, Greece, India, Ireland, Israel, Italy, Mexico, Poland, Romania, Russia, South Korea, Spain and the United Kingdom.